“Government revenues are up, Government spending is down, our deficit is down by 24%, air arrivals are up, and there are 322 more jobs in the Bermuda economy than last year,” Premier and Minister of Finance David Burt said today [Aug 10]. In providing an overview of the island’s finances in the House of Assembly, Premier Burt said, “Revenues collected for the first quarter ending June 2018 are $260.1 million; this is $5.7 million [2.2%] higher than in the quarter ending June 2017. “The primary reasons for the mentioned increase in revenue are due to an increase in Payroll Tax collections of approximately $9.2 million above 2017 collections, higher collections in Passenger Tax of $2.2 million above 2017 collections and higher Land Tax collections of $2.1 million above 2017 collections. These increases were offset by lower collections in Other Receipts of $6.3 million and Customs Duty of $2.9 million. “Current account expenditures, excluding debt service, for the first three months ending June 2018 are $231.1 million; this is $851,000 [0.37%] lower than was spent during the same period last fiscal year. This was despite the Government awarding a 2.5% salary increase to most public officers in 2017/18 which was not reflected in the quarter ending June 2017 expenditure total of $231.9 million. “Yes Mr. Speaker, despite giving public sector workers a well-deserved pay increase, and lifting the hiring freeze which saw many government departments being dangerously short of staff, spending is down this year when compared to last year; and expenditures are presently tracking slightly below budget estimates. “Capital expenditures for the period ending June 2018 are $11.9 million which is $3.2 million below the 2017/18 spend for the same period. “Debt service costs for the first three months ending June 2018 are $47.1 million. This represents $31 million in interest payments and a $16.1 million contribution to the Government Borrowing Sinking Fund, representing approximately one quarter of the $64.2 million annual contribution. Debt service to date is on par with last year’s spend. 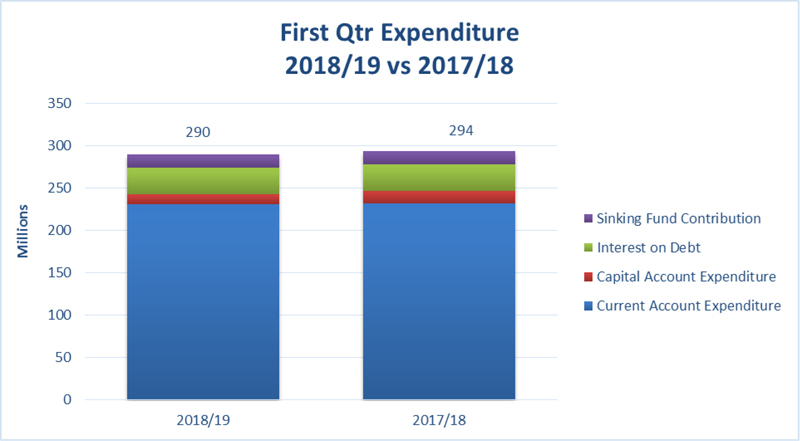 “Overall, total Government spending for the first quarter of fiscal 2018/19 was $3.8 million, or 1.3%, lower than the corresponding period in 2017/18. “For the first three months of 2018/19 Government incurred a deficit of $29.9 million. This compares to a $39.4 million deficit in 2017/18 meaning that our deficit has narrowed by 24% in the first quarter. “The figures show that this government’s approach of targeted investment in growth, while maintaining fiscal discipline is working. One quarter does not a year make, but these figures are concrete facts that indicate that this PLP government is on the right track. “I can report that the total number of persons contributing to Social Insurance as at June 2018 was 33,909. This is 322 more than were contributing in June 2017. “Yes Mr. Speaker, the facts show that there are 322 more people working this year than there were last year. Mr. Speaker, the best news is that out of the increase of 322 jobs, 83% of those jobs were held by Bermudians, and only 17% of those jobs were held by non-Bermudians. Mr. Speaker, the management of public finances has taken on greater significance with the shift in the global economy since 2008. Bermuda is no different and successive governments have wrestled with deficits and the responsibility to deliver services on behalf of the people of Bermuda. Mr. Speaker, governing is about setting priorities and committing revenue raised to support areas of priority based on the mandate provided from the people. Mr. Speaker, to hear the Opposition tell it, this Government has no handle on the public purse and every new initiative is cast as overspending or not thought through. This was closely followed by the Leader of the Opposition who termed this Government as: “quickly becoming a tax and spend Government”. And not to be outdone, the Honourable Member for Constituency 10, the former premier, referring to economic statistics said they were: “showing the potential slowdown or even retraction of the economy”. Mr. Speaker, I can advise Honourable Members and the public that the facts totally disprove this tired narrative from the Opposition. Employment in the economy is up! 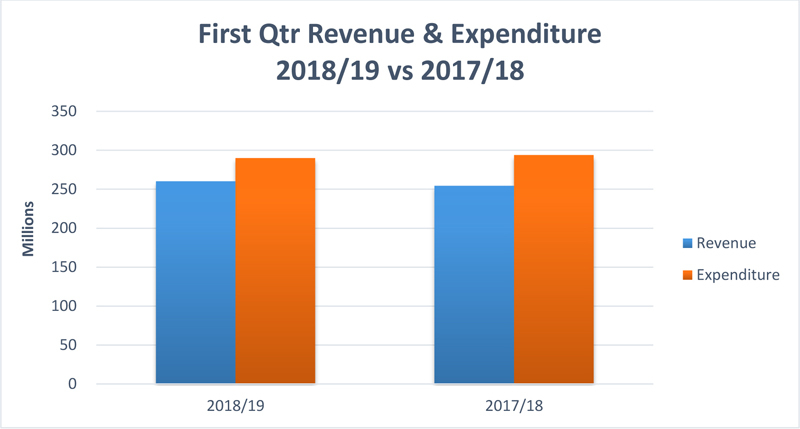 These are the facts, Mr. Speaker, so I want all Honourable Members and the people of Bermuda to understand that in the first quarter of this fiscal year the state of government finances are improving – why Mr. Speaker – because the numbers say so. Mr. Speaker, I will now turn my attention to the fiscal performance for the first quarter of 2018/19 which will demonstrate that revenues are up, spending is down, and the budget deficit has contracted. Mr. Speaker, the headline numbers for the 2018/19 National Budget were: a revenue target of $1.09 billion; current expenditure, including debt service, of $1.12 billion; capital expenditure of $62 million; and a projected deficit of $90 million. Mr. Speaker, revenues collected for the first quarter ending June 2018 are $260.1 million; this is $5.7 million [2.2%] higher than in the quarter ending June 2017. 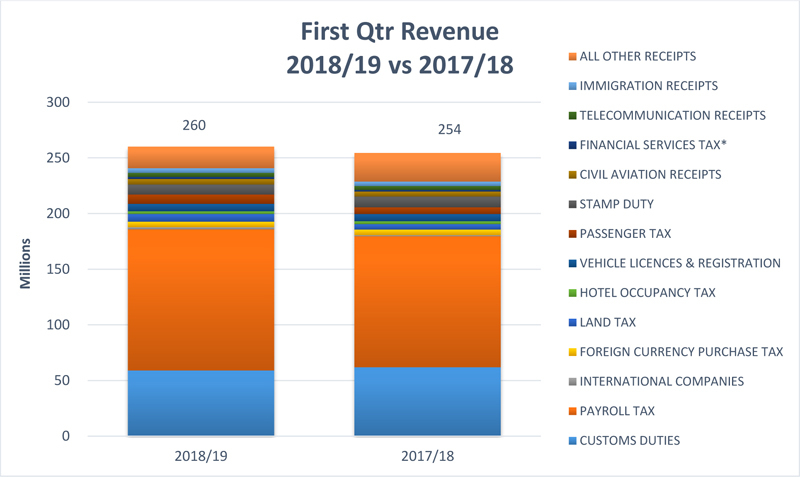 The primary reasons for the mentioned increase in revenue are due to an increase in Payroll Tax collections of approximately $9.2 million above 2017 collections, higher collections in Passenger Tax of $2.2 million above 2017 collections and higher Land Tax collections of $2.1 million above 2017 collections. These increases were offset by lower collections in Other Receipts of $6.3 million and Customs Duty of $2.9 million. In general total revenues are tracking in line with budget estimates. Mr. Speaker, current account expenditures, excluding debt service, for the first three months ending June 2018 are $231.1 million; this is $851,000 [0.37%] lower than was spent during the same period last fiscal year. This was despite the Government awarding a 2.5% salary increase to most public officers in 2017/18 which was not reflected in the quarter ending June 2017 expenditure total of $231.9 million. Yes Mr. Speaker, despite giving public sector workers a well-deserved pay increase, and lifting the hiring freeze which saw many government departments being dangerously short of staff, spending is down this year when compared to last year; and expenditures are presently tracking slightly below budget estimates. Capital expenditures for the period ending June 2018 are $11.9 million which is $3.2 million below the 2017/18 spend for the same period. Debt service costs for the first three months ending June 2018 are $47.1 million. This represents $31 million in interest payments and a $16.1 million contribution to the Government Borrowing Sinking Fund, representing approximately one quarter of the $64.2 million annual contribution. Debt service to date is on par with last year’s spend. Mr. Speaker, overall, total Government spending for the first quarter of fiscal 2018/19 was $3.8 million, or 1.3%, lower than the corresponding period in 2017/18. For the first three months of 2018/19 Government incurred a deficit of $29.9 million. This compares to a $39.4 million deficit in 2017/18 meaning that our deficit has narrowed by 24% in the first quarter. Mr. Speaker, the figures show that this government’s approach of targeted investment in growth, while maintaining fiscal discipline is working. One quarter does not a year make, but these figures are concrete facts that indicate that this PLP government is on the right track. Mr. Speaker, in my highlights I spoke about the fact that tourism numbers were up. When we were in opposition, we pledged to invest more in tourism and we have done that. Bermuda is reaping the results of that investment and that is positive progress for our island. From April – June 2018, with figures compared to the America’s Cup in 2017, visitor air arrivals, which is the most important measure of tourism health, are up by 5.4%. Just as important, hotel occupancy for the same quarter was up by 4.8%. Mr. Speaker, the last highlight that I gave when I started this statement is probably the most important – “employment in the economy is up”. Mr. Speaker, this Government promised economic diversification and investment to provide additional jobs. We pledged to put Bermudians first, and to make investments that stimulate entrepreneurship and create economic growth. Are we where we want to be? The answer is no, but this PLP government has made progress. Mr. Speaker, one way of gauging the current state of the job market is through the number of persons paying into the Contributory Pension Fund [Social Insurance]. These statistics provide a decent snapshot into the number of persons that are working in the economy. Again Mr. Speaker, the facts are positive. Mr. Speaker, I can report that the total number of persons contributing to Social Insurance as at June 2018 was 33,909. This is 322 more than were contributing in June 2017. Yes Mr. Speaker the facts show that there are 322 more people working this year than there were last year. Mr. Speaker, the best news is that out of the increase of 322 jobs, 83% of those jobs were held by Bermudians, and only 17% of those jobs were held by non-Bermudians. This is proof that not only has this government supervised a growth in jobs, but we are holding true to our election promise of putting Bermudians First. Government revenues are up, Government spending is down, our deficit is down by 24%, air arrivals are up, and there are 322 more jobs in the Bermuda economy than last year. Mr. Speaker, this Government has demonstrated that you can do more for seniors, you can do more for students who want to further their education and that you can do more to reduce the burden on hardworking Bermudian families AND do so while properly managing a national budget. Mr. Speaker, this First Quarter performance shows the people of Bermuda that this Government is determined to work for them, maintain control of public finances and lift them up in the process. We are on course for increased economic activity and growth that targets Bermudians who, thanks to this Government, now have a chance to benefit directly from Bermuda’s economic success. This will be another “we had to decive you” moment. I don’t trust their math one bit. He said he has a plan and this is even before the crypto strategy begins to pay dividends! PLP have cut Capital spending back to almost NOTHING. Bermuda’s Tourist and Work Permit Holders got a clear PLP message at Shelly Bay this week – “YOU ARE NOT WELCOME HERE”!! That’s just your imagination running away with you there. Any tourist is welcome to visit Shelly Bay beach (& many do). What does what happened with the Shelly Bay Beach plans have to do with work permit holders? Stop with your misinformation & bogeyman rhetoric, people didn’t fall for it before & aren’t going to fall for it now. Believe Burch then you believe in the tooth fairy. Stop with the OBA America’s Cup tagline for increase in tourism! Better still why don’t we ask visitors why they travel to Bermuda? Bam! In the overall scheme of things these changes are minor and mainly come from PLP Tax Increases. Very LITTLE Capital Investment by PLP Govt. Large drop in Customs Duties- very concerning as it indicates much lower imports which will translate into lower sales by Retailers, Wholesalers & Restaurants which will eventually translate into job losses. Also, February 2019 Budget is going to have $200,000,000.00 in NEW TAXES along with the Living Wage which will quickly STOP economic growth & create new Unemployment. Remember that last year was the run up for America’s Cup so a decline in duty should be expected. What you have to look out for is year over year figures. Looking at one quarter is folly. PLP going to be so upset cuz it looks like Air Arrivals are going to hit or exceed “The New Airport targets”! So you think air arrivals are up because tourist heard we’re “going” to have a new airport? Serious? No, air arrivals are up because the oba negotiated more flights with the airlines. The building of a new airport terminal and the hosting of the much maligned America’s cup probably made those negotiations possible. Burtcoin needs to talk to the Auditor General about the little 2.4billion we owe and stop sending out false messages that we are Financially ok BECAUSE WE ARE NOT no OBA to blame now so SORT IT OUT! If there is good news in the short term you have to blame the OBA. Measures that they put in place will have some impact for a while. The current government has only increased taxes and really not done much to improve our debt crises. Lets look at the next six months and see how we are doing. The Premier’s statements seem difficult to reconcile with the Auditor-General’s report. Her report says that there is no effective long-term plan for reducing the public debt, or the unfunded liabilities of pension plans, or the size of taxpayer indebtedness, “all of which continue to grow unsustainably”. Far as I’m concerned, we still have an OBA economy. Far as I’m concerned, we still have an OBA economy and it’s why it’s looking positive. Good thing the rest of the world isn’t locked in that same mind set. Well ratings agency S&P seems to have that mind set: In April 2018, S&P said, “The positive outlook reflects our expectations that, in the next two years, Bermuda’s economy will continue to see positive, although fading, real growth largely from revived tourism demand following the Americas Cup in 2017, and the effects of several large-scale construction projects” Fintech, hurry up and produce jobs and revenue, because the positive ‘lag’ effect of the previous administration has an expiry date. If one accepts the economic theory that economies take 4 to 5 years to react to political change that would be correct. Oh, so he can speak?? Was wondering if the Party Leader had any spine after letting Laverneee and Cornel Major General “Sleepy” call the shots at Shelly Bay. It’s called listening to the people, had the last government tried it some time then maybe they would still have been in power. Didn’t listen to the ATV objectors did they? They did not listen because a deal was made !!!! How can you claim the deficit is down 24 percent after one quarter ? Surely, that has to be judged annually and also if revenue increases are due to tax collection shouldn’t you be giving us ,the people , the credit rather than self congratulation. I’m relieved that this Plp government isn’t spending like previous ones but let’s hope for a little less politics when they are delivering the facts. If the figures were poor, they would have said nothing at all. Move on nothing to see here. Truth is the effect of the OBA and America’s Cup lingers. Burt would be credible if he pointed to the changes he has made as FM to bring about positive results. Salary increases for simple servants is not a useful comment – unless you are looking for votes in 4 years. How many of these news employees work ar the airport or at the Loren? The PLP won’t tell us. Many are working at the must needed airport……..
No they don’t want anyone to think the OBA terminal project is good for Bermuda. Sad bunch. How many of the 332 are Government workers? It’s easy to hire Bermudians for Government, but who will pay for them? More debt? The living wage nonsense is going to completely kill any economic growth. Burt claims to be an economist. He must have skipped a lot of classes. In a couple of years there will be a very different story coming from the PLP. Blame will be impossible to focus elsewhere. Flat out untruth. The deficit is not down by 24%. Bitcoin Burt math, then the auditor general’s math. Things that make you go bitcoin pyramid math a myth. Well, isn’t that just a magical Trumpesque like load of b*ll sh*t. While I’m not surprised by the dishonesty, I am a little taken aback by the boldness of it. Are we going to see Burt sending out liar, liar pants on fire Trumpesque tweets from now on? Just because you see another country’s leader acting like a tw*t, doesn’t mean you have to follow suit.